Hospitals today are faced with rapid industry changes and greater financial pressure. The ability to quickly and efficiently process claims for reimbursement is not only important, it’s critical to financial success. Hospitals need to understand issues impacting their payment velocity which greatly influence outstanding accounts receivable. 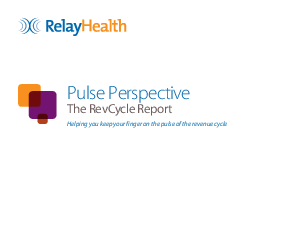 The Pulse Perspective is a macro view into the billing processes of hospitals and the speed or velocity of payer reimbursements. The report leverages RelayHealth’s unique data assets representing millions of claims processed each year across the U.S to analyze common hospital billing processes from patient service to payer payment resolution and shows the median payment velocity across all hospitals, by geographic region and hospital size.